Hi all animal lovers, my name is Bonnie Gail Carter. 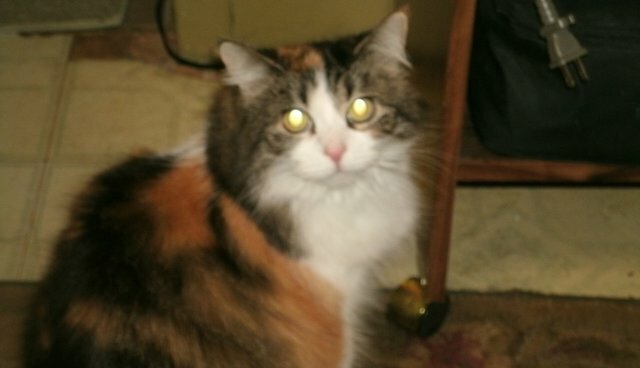 I thought I'd share the story about how I got my long haired Calico cat named Cali. At the time I was living in Lafayette, Indiana but I now reside in Peru, Indiana. About seven years ago I called Petsmart and asked the man who answered the phone "Do you have any cats?" He said, "Well we have this one cat that keeps biting everybody and she's depressed and won't eat." Most people would pass on a cat that was biting everybody but instead I said, "I'll be right over to get her." I didn't have a car so I took a metal cart on wheels with me on the bus to go to get her. I bought her litter box, litter, and Purina real chicken with hairball control for her to eat. They put her in a box with vent holes in it on the top of my cart. On the bus ride home I kept talking to her telling her things like "everything is going to be alright now that you have somebody who loves you." When I looked up I saw the people on the bus looking at me like I was crazy. I told them, "I'm not talking to a box. My new cat is inside the box." A couple of people asked me questions about her like, "What kind of cat and what is her name?" I told them that they didn't know her name or how old she was either. I named her Cali short for Calico. She never bit me and she loves her food. It's the only food she will eat. She won't eat cat treats, canned cat food, people food, a can of tuna or anything else to this day. It took me about eight months of working with her to get her to look me in the eyes. She has been a very loving cat and my best friend ever since. My ankles will swell up due to Cellulitis and Cali will lay on top of my ankles when they are hurting me and it makes me feel better. She talks to me a lot and I talk back to her. She knows what some words mean, especially food. I don't know why she didn't bite me when I started petting her at the pet store but I think she chose me just as I had chose to go and get her. I didn't want them to put her to sleep for biting everybody. I'm allergic to cats and dogs so I have to take an allergy pill every night. My Cali is worth everything to me. She loves me and I love her. We were meant to be together. Thank you to all animal lovers for being there for them. They need us but I think we need them just as much as they need us. Thank you.